I’m such a huge fan of one pot and slow cooker meals. Moreover, this Caribbean recipe certainly hits the right culinary buttons. 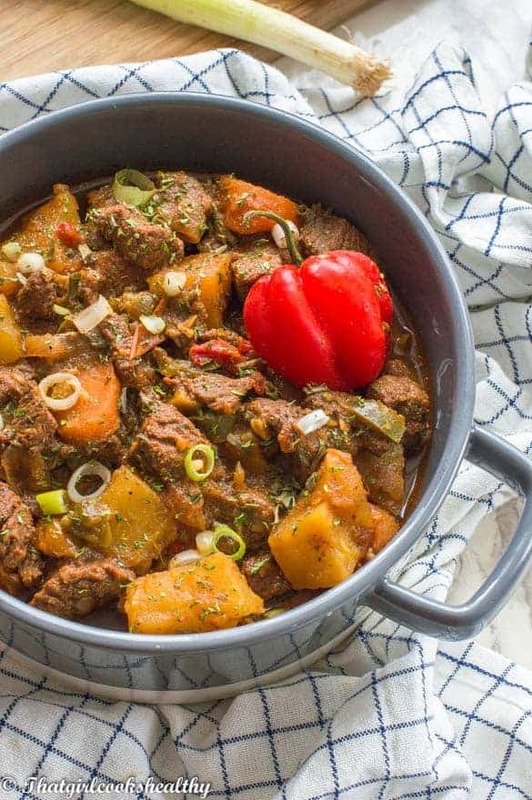 This Jamaica beef stew recipe is probably my favourite beef recipe of them all. Why? Because it’s packed with flavour, made using one large dutch pot (dutch oven) and brings back some old school memories. 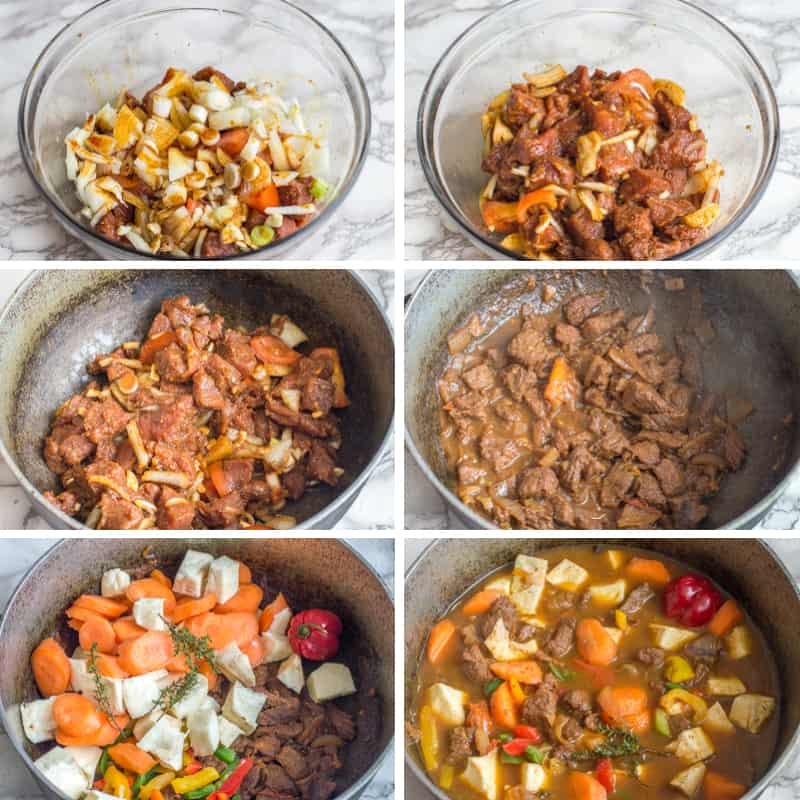 You can’t really go wrong with a one pot Jamaican beef stew – the only biggest hurdle is the preparation and once you’re over that hurdle, it’s smooth sailing. 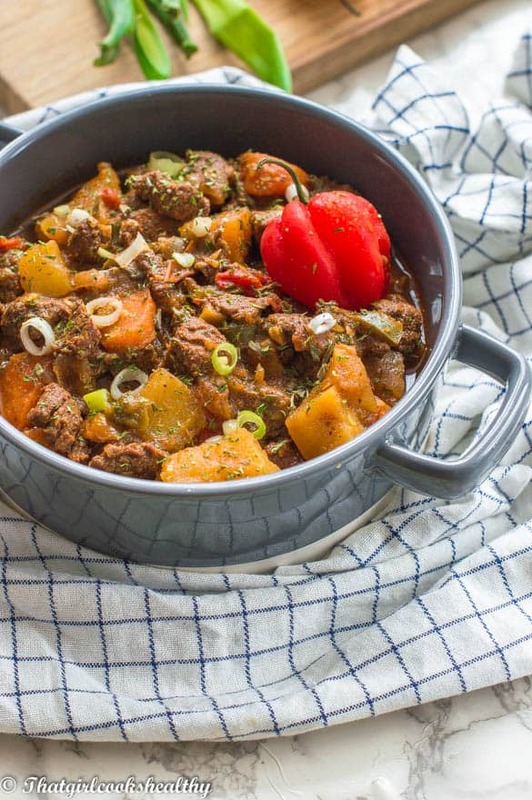 Beef stew or stew beef as the Jamaican linguistics would call it, is so hearty and rich. While the recipe to hand might remind you of the ultimate comfort food, in the Caribbean “stewing” is big business. If you don’t believe just check out my Jamaican brown stew chicken recipe. The aforementioned is just one excellent example of Jamaican stewed meat at it’s finest. 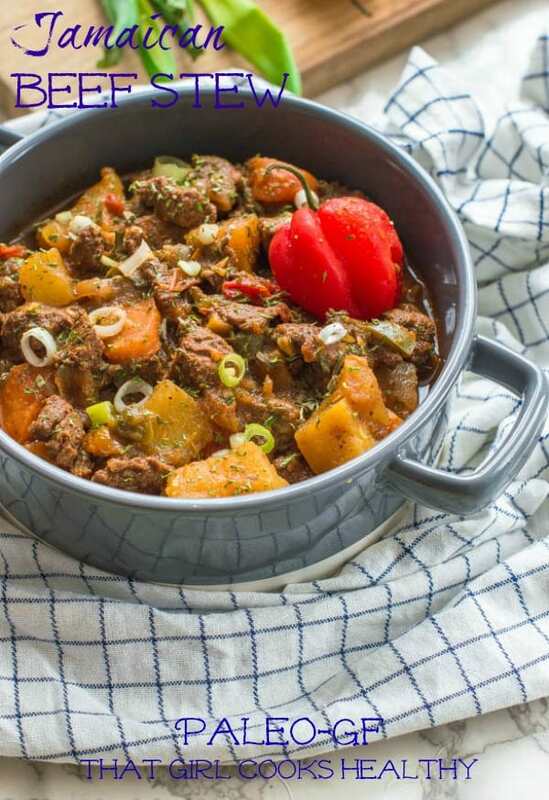 Whether it’s summer or winter, rain or sunshine, this Jamaican beef stew is guaranteed to be a crowd pleaser. It’s also a great way to impress your guests or family with a Jamaican cuisine that’s not predictable i.e Jerk chicken. In other words, it’s a unexpected Jamaican dish, but one that your loved ones will adore. I know my family never get tired of this recipe and I don’t get tired of making it either. 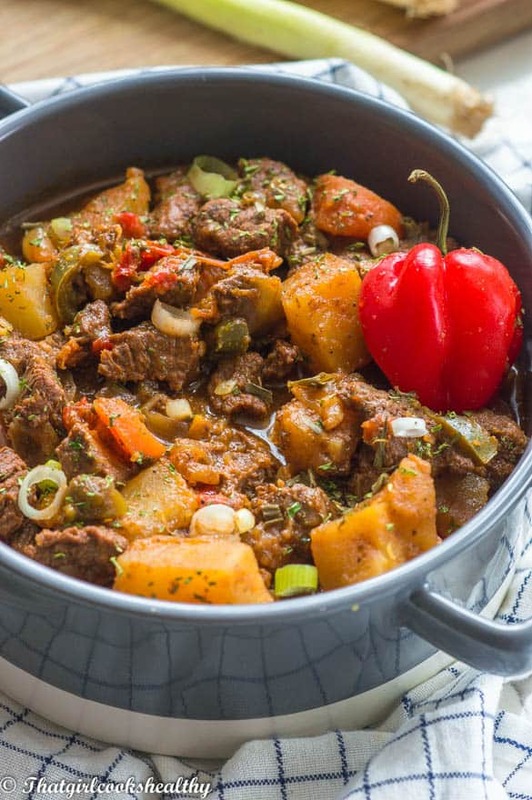 How to prepare a tasty Jamaican beef stew recipe? Speaking of making the dish, my choice of pot was something that’s quite common amongst English speaking islands – a dutch pot or dutchie as some call it. If you don’t own one that’s fine because a casserole dish or dutch oven will work too. The key is to use a pot that’s quite deep so it accommodates the large quantity of solid foods. 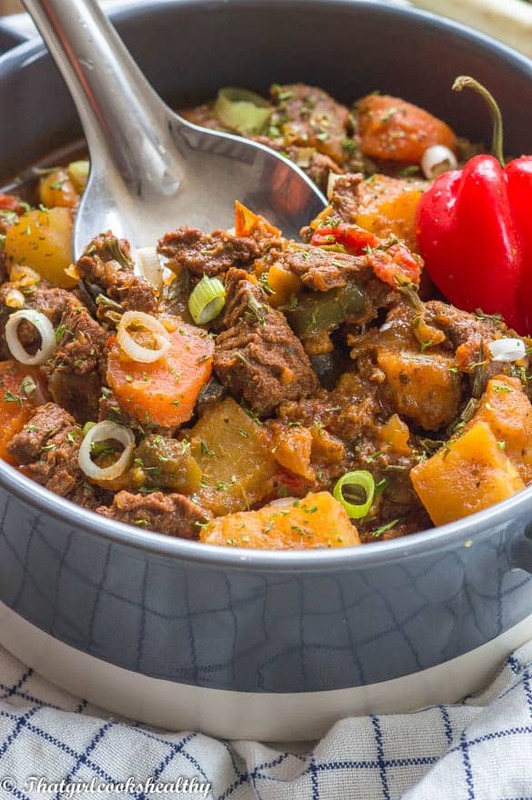 You don’t need the most premium cuts of beef to recreate this Jamaican style beef stew. Just some good old stewing steak that’s precut into small cubes should suffice (that’s what I usually use). What is Jamaican beef stew eaten with? Typically you’ll find Jamaicans have a fondness for using Irish potatoes (white potatoes). I don’t really promote the consumption of white potatoes simply because they cause an instant spike in glucose compared to white or orange sweet potatoes. From a nutritional standpoint sweet potatoes would be a more viable choice to use. How long does the beef stew take to cook? The beef although cut into small chunks, still takes awhile to cook. We are talking a total of 1 hr and 20 minutes from start to scratch. With that being said, don’t let this discourage you from making the recipe. If you’re impatient or simply want the recipe to cook while attending to other chores, use a slow cooker instead or pressure cook the meat to fast track cooking . Alternatively, the dutch pot, stove method works which is what the recipe calls for, works just fine. 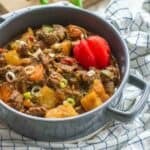 What seasoning is needed to make the stew? I have listed all the ingredients needed to make the dry rub for the beef. Don’t be scared to use a lot of seasoning especially for this recipe because the liquid will need to be absorbed during the first stages of cooking and also with the additional use of water. The generous amount of seasoning really balances it’s self out in the recipe. Is it really necessary to use a coffee grinder for the seasoning? No, it’s not crucial but highly recommended. There’s a huge difference in flavour and taste when seasoning is milled in a grinder versus just mixing them together. Alternatively, you can also use a mortar and pestle if you own one. If you don’t have none of the aforementioned, don’t worry as it you can still mix all of the ingredients together in order to create the beef seasoning. You will need my homemade browning sauce for the Jamaican beef stew to enhance the darkening of the meat. If you have a spice/coffee grinder (high recommended) add all of the ingredients for the beef seasoning to the grinder and mill them into a fine consistency. skip this step if it doesn’t apply. Place the washed beef in a large bowl then proceed to add all of the ingredients which form the beef seasoning to the bowl. Add the browning sauce, chopped onions, garlic, scallion and tomato (not puree). Use your hands or a spoon to work the seasoning into the the beef to create a wet rub. The use of hands is so much better to really work those herbs and spices into the meat. Set the bowl aside to marinate for at least an hour or overnight. Melt the coconut oil on medium heat in a dutch pot or casserole dish. Then add the marinated beef to the pot and begin to sear. Stir the beef so all the beef pieces are evenly browned. This will take a few minutes to complete. As the beef begins to brown add the thyme and reduce the heat to low and put the lid on the pot. Let the beef continue to brown and cook through for 10-15 minutes. During the given time you may notice an increase in liquid. Remove the lid, increase the heat to high so the liquid absorbs and decreases. This is done to further seal in the flavour. Keep a watchful eye and stir at times if needed to avoid the beef charring. Once the liquid has evaporated (or almost) add the carrots, bell peppers, pimento (all spice) sweet potatoes and scotch bonnet – stir and combine. Finally pour in the cups of hot water and tomato puree then give another stir before bringing to the boil then reduce the heat to low with the lid on. Making this now. It looks great. When do you add in the tomato purée? Hi Tom. Apologies, add the tomato puree when you pour in the hot water. I’ve amended the post to reflect this missing step. I do hope you enjoy the recipe and any feedback would be appreciated. Thank you so much for your feedback Kimberly, so glad the kids liked it too. This stew looks absolutely delicious, and is a perfect year-round recipe!!! Yes! This a true Jamaican recipe! Got to have that Scotch bonnet pepper in there giving some serious heat! I loveee stew beef and am so excited to see this recipe. Also, I have the same pot you used…it seems like a necessity for every Caribbean household. Can’t wait to try this recipe. This stew looks well seasoned! I can smell the aroma and taste the flavor from my computer. Yummm! I could have this for dinner tonight. Everything about this reminds me of home! This recipe is spot on! This looks so good, but can I substitute the scotch bonnet with another pepper? Can’t even find it at my local store. Yes. You can use another fiery pepper like a whole chilli or habarnero instead. Just wondering if this would work in a crockpot. Yes this is a crock pot friendly recipe, Brown the meat prior to adding it to your crockpot though. Hi … I don’t see where you’ve added the Thyme….? Sorry Neha. I just updated the recipe, you add the sprigs of thyme after the beef has been browned and ready to simmer down. Charla, it’s awesome! I cannot wait to try this. I bet it makes the house smell divine and tastes incredible! Thanks Alyssa. You will love this recipe!! Charla, this looks tasty! These are absolutely mouth watering! It will quickly disappear in our house, very tasty and flavorful! Am making this stew now. At what point do you add the chopped garlic? Thanks!